As we slog through another miserable day, it’s not hard to look around and wonder what good there is left. What light remains upon this troubled Earth? Does not an ever-gloomier cloud cover the sky above? Perhaps. But things aren’t all bad; the Lotus Elise exists. You, a human, could walk outside right this very moment and be greeted with the sight of a Lotus Elise driving by on the nearest road. Brrrrrrm it goes, happily revving across the planet. You could even be one of the lucky humans who owns a Lotus Elise. You could open your front door, walk outside, walk back inside realizing your garage door is closed, walk through your side door by the kitchen and then see your own beautiful Lotus Elise smiling back at you. Hello! says the Elise. I am a car that has physical form and is not simply an intangible idea! Yes, the Lotus Elise does approximate the automobile in our mental ideal. We think of driving, and the Lotus Elise has that of which we imagine. The engine behind our ears, the steering wheel in our hands, the manual transmission lever also in our hands. 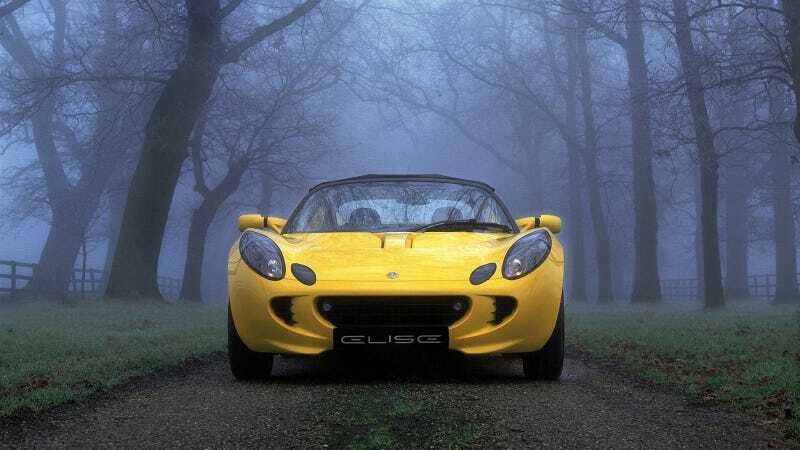 There is not much else to haze the experience; the Elise has what we think of and little else. It is not hard to think that the Elise might only exist in idea or theory. We might imagine that Elises only exist in an EVO-esque fantasy land of no-police b-roads across some distant countryside. In fact, Elises exist in a real land of real-policed real roads across real countrysides. The engine notes are not dream-tones. They are genuine sounds hitting eardrums reverberating with life. So be glad, if only for a moment, that this thought-car exists not only as a brain-happening but a world-presence, to be seated on and driven by and reveled in. Where Are The Little Cars, Light And Lithe?